Take a step in the right direction for you or your organization's security. Many offices and homes today deal with sensitive financials, tax documents, and client information. Make sure you are properly disposing of these to protect you and everyone else. We offer a large line of strip cut shredders to get you going on the right track, offered in the top of the line brands like HSM, Swingline, Fellowes and more. We've got everything from small personal, to industrial high capacity, high volume machines in this line, just make sure you check out the specs first and make sure you get the right one for your needs. Take a look at the giant selection below. Waste Bin Capacity: 6.6 gal. Waste Bin Capacity: 12.7 gal. Waste Bin Capacity: 21.7 gal. Waste Bin Capacity: 26.4 gal. Waste Bin Capacity: 14.5 gal. Welcome to MyBinding video. 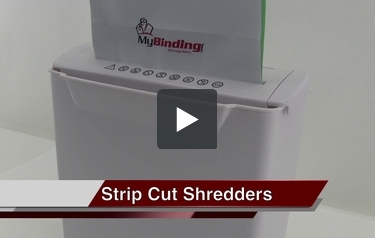 Perhaps the most popular paper shredder on the market is the strip cut shredder. Commonly used for small office, home office and personal use, there are plenty of companies and options to choose from. Shredding your document with long, narrow strips the length of the document itself is the level 1, 2, and sometimes 3, paper shredder. As you shop around, you’ll want to keep in mind the size of the machine itself. Is it going to fit on a desk, underneath a desk, in the hallway somewhere, how much room do you actually have for the machine? Some of them are pretty small but some of them are pretty sizeable. Strip cut machines are the fastest on the market, it’s because they don’t have to cut as much of the paper, but you’ll want to think through just how much are you going to use this product and how fast do you need it. Also, think of how wide the mouth is. Is it going to be wide enough for the documents that you shred? And if a 1, 2, 3 security level is just fine for you, then a strip cut shredder may be your best choice. If you have any questions at all, just give us a call and we can help you out. Also, most of our products have a video so you can see it in action before you buy. For more demos, reviews and how-to’s, check out MyBinding.com.